I'm trying to get all the details straight for recreating the uniform for an 88th Field Artillery sergeant. It's being put together for when I do presentations on Bataan and the Scouts, I wanted to make something that could be worn or displayed and handled. 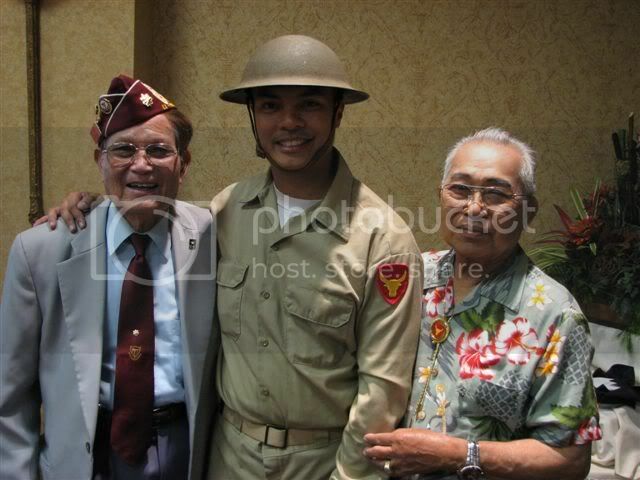 The idea for an 88th sergeant is a tribute to Jose Calugas. I've never seen pictures of the 88th in action or training but have had to work with images and information I could get on the Scouts in general and pictures of other field artillery in the PI and US at the time. Some of the things I'm trying to nail down are whether they carried M1911 pistols or M1903 rifles, since other artillerymen I've seen carried pistols on gunbelts in training, and which gas mask and bag they used. Any information would be helpful, especially a unit history and crest. I read Col. Melvin Rosen's recollection about their rifles. He was with the 86th FA PS. I would think they have the same equipment as the 88th. He mentioned that the artillerymen were armed with 1903's. The infantry and cavalry were armed with M1 Garands. Those without rifles most likely were armed with sidearms, the 1911 .45 pistol. Their gas masks would have been the kidney shaped M4A1 but many of them also had the elongated ones. Thanks a lot for that! I read the earlier post about the 1903s but wasn't sure if that was across the board for artillery. Do you know at what point one was considered senior enough of an NCO to carry a pistol instead of a rifle? I've seen reference to NCOs carrying sidearms, but I've never actually seen a picture to verify. I've gotten both a M1936 pistol belt and a M1917 dismounted cartridge belt (with the puckered pouch bottoms). Where can I find the Colonel's full interview? My mistake he was with the 88th FA. Not the 86th. I'll have to dig it up. I chanced upon it many years ago online... and it was a PDF. Do you still have the rest of the interview with Col. Rosen by any chance? Here's what I've got together, it's a mix of original and reproduction gear. The reproduction parts are from WWII Impressions and At the Front. Since the idea was that I could let people handle this stuff and have it feel real (but without endangering any pricey real artifacts), I figured it was best to bite the bullet and pay more for the better quality stuff. I was surprised at how cheap the World War I items- meat can, utensils, etc. were on eBay. Guess if it's not WWII Airborne not enough people care to raise the price. This forum has been very useful in hunting down some of the details. 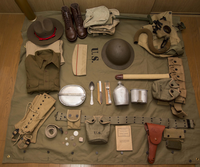 The original items are the M1910 haversack (sans E-tool and carrier), gas mask (but not the bag), M1910 .45 ammo pouch, M1918 canteen, M1918 meat cans (one is standard, one is a French-made steel one), and utensils. Theoretically the M1918 cartridge belt is original, I got it for $20 at a gun show 7 years ago. The price was good, so original or not I got it. Fantastic! 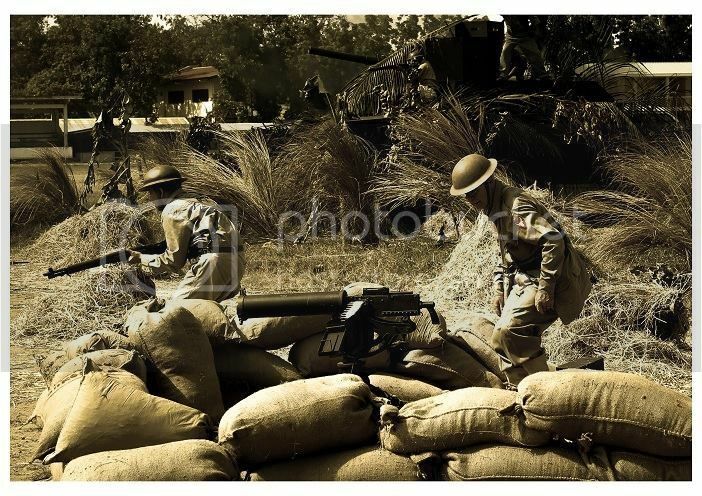 Are you doing living history with a group? I'm glad this forum has been of help to you. Just a lot of onlookers now. Not a whole lot of participants. They've all moved on to other social media. I myself have not been sharing as much here as I used to. Been busy. Unfortunately I'm not with a group, I live In Japan. This is the updated kit. Recently I found a 24th Field Artillery Regiment device for the cover, but it hasn't arrived yet. I can't find anything for the 88th, so I'll just make do with that for now. I really appreciate that. From the chart you've posted on here of the different unit insignia I got the same impression, but that left me wondering what did they use because I don't see the army just letting them not use a DUI of some sort. "The 88th didn't have a DUI. They probably wore numbered artillery collar brass... or unnumbered ones"
Thanks for tracking that down. I have the artillery collar brass. I think by 1942 they'd stopped using numbered ones. Started talking with our local base elementary school about doing a presentation for the 3rd-6th graders. Now I need to figure out how to explain the Bataan Death March & Hell Ships to 3rd graders without giving them nightmares. I'm only half-joking when I say that. Papang was no older than these kids when he watched a Japanese soldier skewer a baby on a bayonet and, since the Japanese took over his aunt & uncle's house (next door to his), he got used to seeing men chained to a post and left to die in the elements in front of it. Finally got to take the whole kit out for my command's Asian American Pacific Islander Heritage Month celebration. Its funny how all this gear would travel easily on one man, but is quite the handful when moved in boxes! Unfortunately I'd get too many strange looks if I just packed it all up and wore it from home. Wow that's great! Is that specifically a display on the Scouts? Were there a lot of people at the event? The display was on the Scouts and the Battle of Bataan. We had a good turnout, more than 40 people showed up. It's a command multicultural committee event, so that is a lot for us. Congratulations! Thank you for representing the PS. Maybe sometime when you're back stateside you could team up with a living history group. I sure wish you could have met some of the veterans. There are still a few left. Let's hope. This picture was from 2009. Many of them really wanted to take pictures with the PS reenactors... and the reenactors were so awed and honored to be with the real PS. I would love to do that if I ever get back to the US, and meeting the actual Scouts would be great. I would probably drive people nuts with all the questions.